Sealing cracks throughout your facility via caulking or glazing can help reduce cooling and heating costs. 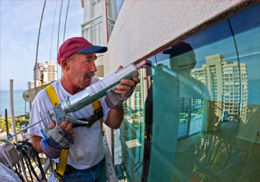 Stathakis is skilled in applying both - our glazing work is neat and our caulk beads are straight and clean. 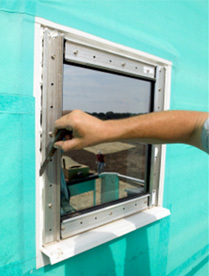 Glazing is used as a seal between window glass and the frame. With proper application, it provides a weather-tight bond that will last indefinitely. Caulking forms a flexible seal on gaps around foundations, doors, windows, vents and other openings that can let in summer heat and winter cold. Find out if your building can benefit from caulking or glazing. Ask our professionals to come out for a free inspection. Call today at 1 (800) 278-1884. "I think Stathakis is the most progressive small business company I have ever worked for. They appreciate their employees and customers." Professional Caulking. Trust our pros to create a tight, smooth seal in your facilities joints and seams.